Countless Allied lives were saved in World War II as the result of a top-secret Hopkins research project. Opening photo: The VT fuze vastly increased the accuracy of anti-aircraft guns. Rumors ricocheted in neighborhood barbershops and front porch gatherings as the heat settled over suburban Washington in the summer of 1942: What was going on at the old Wolfe Motor Company building, 8621 Georgia Avenue, in Silver Spring, Maryland? The big "USED CARS" sign was still tacked to the brick wall outside. But the security guard kept greeting everyone as Doctor. And groups of women would arrive at night and leave in the morning. Some neighbors assumed the building had been converted into a wartime experimental medical facility. A Washington Post story further confused things: "Hopkins Institute Revealed as High Class Call Girl Ring," those involved remember, a case of mistaken identity on all fronts. What was going on behind the high, shade-drawn windows at 8621 was secretive but legal--and nothing less than one of the pivotal R&D successes of World War II: the creation of a variable-time (VT), or proximity, fuze that vastly increased the accuracy of anti-aircraft guns and similar weaponry. In the words of U.S. Army General George S. Patton: "The new shell with the funny fuze is devastating. ... I think that when all armies get this shell, we will have to devise some new method of warfare. I am glad you all thought of it first." 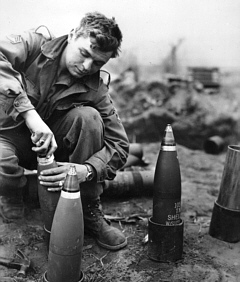 Previous methods of warfare meant that gun crews had to first calculate the range and speed of a target to explode an artillery shell close enough to do damage. Detonation fuzes either ran on a timer or exploded when the shell hit an object. But the ineffectiveness of such fire was notorious: WWII naval gunners often needed hundreds of rounds of ammunition to hit one fast-moving plane. The U.S. Navy wanted a smart fuze that would automatically detonate a shell close enough to a target to destroy it, better protecting American fleets. But how? For years, the Germans, the British, and the U.S. Navy itself had unsuccessfully worked to develop a more advanced mechanism. Hopkins joined the effort when the National Defense Research Committee (NDRC), which was formed to bring America's defense technology up to speed after World War I, chose Merle A. Tuve (PhD '26) to lead the project. Tuve developed a prototype of a radio proximity fuze in 1941 while working as a chief physicist at the Carnegie Institution. When a need for more space and another sponsor arose, Tuve convinced the committee to bring the project to his alma mater. Hopkins leaders agreed to sponsor fuze research, a U.S. Navy- funded $800,000-plus project so secret the Hopkins board of trustees would know nothing about it. The fuze project, known as "Section T" for Tuve, led to the formation of Hopkins's Applied Physics Laboratory. "The partnership between APL and the military establishment had just begun," notes author William K. Klingaman, whose history of the lab, APL--Fifty Years of Service to the Nation, chronicles much of the fuze story. The fuze was a phenomenal feat. Using experimental radio technology, shells armed with the proximity fuze in their noses sent out radio waves that bounced off another object--a plane, a tank, the ground. As the shell got closer to the object, the impulse received by the fuze grew stronger until the electrical impulse became strong enough to detonate the shell, usually within 75 feet of the object. Researchers at APL tested various fuzes, which were not much bigger than a human hand, looking for creative solutions to glitches. (For one, the device's miniature vacuum tubes had to withstand the shock of being fired from a gun at 20,000 times the force of gravity.) About a year after the project came to Hopkins, the VT fuze entered mass production. More than 22 million proximity fuzes were produced in 110 factories across the United States before the war's end, according to Klingaman. Current APL scientists remember. "There is no comparison between the rules that govern research and development during wartime and those that govern R&D now in the postwar era," says Alexander Kossiakoff, chief scientist at APL and a former director of the lab, who arrived in the mid-1940s. "There were no obstacles put in the path in terms of money, time, and what everyone wanted to get done." Some of those workers included dozens of women who arrived at night to put together the experimental fuzes that were tested daily--a group that named themselves "the wench bench." Thomas W. Sheppard who left the East Texas Broadcasting Company in 1942 to join the project at $42.50 a week, was one of many top scientists and technicians recruited from across the nation. "We all felt responsible for the success or failure of the program," he says. The Navy used the fuze extensively in the Pacific theater: it increased the gunners' efficiency threefold in targeting enemy aircraft. "Without the protection this ingenious device has given the surface ships of our Fleet, our westward push could not have been so swift, and the cost in men and ships would have been immeasurably greater," remarked James V. Forrestal, secretary of the Navy. At APL, the technology developed in creating the fuze later led to advancements in guided missiles, which made way for other more complicated military technology. Today, that includes the prototype Area Air Defense Commander (AADC) system, a defense planning tool that gives commanders a 3-D display of aircraft, ships, and defense systems in a region; the system uses computer software and processors capable of executing 56 billion instructions per second. But the tiny VT fuze was pretty high tech for its time. Before the end of the war, APL researchers designed a compact version of the fuze for howitzers and other high-velocity guns. World War II military leaders and prisoners of war remarked on "the [Allies'] devastating artillery fire" in the European theater and during the Nazi V-1 buzz bomb attacks of London in the summer of 1944. Sheppard, who became head of APL's Fleet Systems Department before retiring in 1987, sat looking through his own fuze memorabilia one afternoon at the APL lab in Laurel, Maryland. He remembers what was at stake in the world in those days: "The proximity fuze made an important contribution in stopping the aggression of Hitler and company."